Thank you for your interest and support of PCD Smiles. Since starting this program with my husband's support, the outporing of support from the PCD community has been astounding. As I have spoken with recipients, parents' of recipients, and donors alike; the one question that seems to be on everyone's mind is, where did the idea for PCD Smiles come from? So here is my answer to that question. I was inspired to start PCD Smiles because, as a child, I was a frequent recipient of the Ruth Lyons Children's Fund (originally known as the Ruth Lyons Christmas Fund); growing up in the Dayton, Ohio area. Upon checking in for my hospitalizations for PCD (Primary Ciliary Dyskinesia), I got to select one free toy from the toy cart in the admission's office at the Dayton Children's Hospital. To this day I still own most of the stuffed animals that I had chosen. The free toy was a big part of each of my hospital stays. The toy helped me create my own little world where I could escape and cope with my medical treatment. With PCD Smiles, I hope to bring that same opportunity to other PCD patients; no matter their age! Nebulizer machines turn liquid medication into a fine mist that the patient then inhales. Proper care and feeding of your nebulizer and it’s components like nebulizer cups, tubing, spacers, masks, mouth pieces, and even the nebulizer’s air intake filter are extremely important. Improper care can lead to an increase in lung infections and or acquiring bacteria that you have not previously cultured. It’s important to remember that the patient will be breathing in the mist that is created inside the nebulizer cup. So a clean nebulizer and nebulizer components are a must to maintain airway health. There are several ways to approach daily cleanings of reusable neb (nebulizer) cups. One is to use a fresh clean reusable neb cup for every treatment of the day. So if you need four breathing treatments a day, you will use four different and clean neb cups a day. After using each neb cup for the day, simply set each used neb cup aside for cleaning after your last treatment of the day. With this method it is safe to use the same neb cup for each of your medications; assuming you follow the path of bronchodilator first, followed then by your mycoltic (hypertonic, pulmozyme, etc), and lastly your inhaled antibiotics. Remember bronchodilators first, then mucolitics, and lastly your antibiotics; if you don’t do them in this order it is important to do them each in separate neb cup. Its also important to remember never to mix the medications altogether at one time either; refer to your health care provider for your care team’s desired medication order for your unique health picture. The other way way to approach daily cleanings with reusable neb cups is to thoroughly clean, disinfect, and dry after each and every single breathing treatment. And the last option for daily cleaning is, if you are using a disposable neb cup, you simply throw it in the trash after each use. Disposable cups are meant to be used one time only. Daly cleanings are an important part of a patient’s respiratory health; as the patient will be breathing in a mist created by the neb machine. Daily cleaning recommendations really boil down to what is the patient’s respiratory disease. In CF (Cystic Fibrosis) and PCD (Primary Ciliary Dyskinesia) it’s important to go the extra step of disinfecting every single day to prevent the spread of germs and bacteria. So reusable neb cups should be cleaned first, then disinfected, rinsed, and finally air dried every single day. To clean reusable neb cups, they should be taken apart piece by piece; though do not remove any valves or the valves off of the face masks and or mouthpieces. Fill a bowl with warm water and dish soap, place nebulizer parts and masks or mouthpieces and any spacers into the solution and let soak for fifteen minutes. After fifteen minutes swish the parts around in the solution, then remove and put in clean sterile water or rinse with clean sterile water. Pull out the pieces from the clean sterile water and shake off the excess water from the pieces; then immediately follow with disinfecting the pieces. It is important to note that the use of antibacterial dish soap or white dish soap in the cleaning solution is NOT appropriate for some neb parts from various manufacturers; please refer to the manufacturer of your nebulizer and it’s parts. There are multiple ways to disinfect, depending on your neb manufacturer. Please refer to your neb manufacturer on which is best; the cold method or the hot method. The hot methods for disinfecting are as follows; boiling for five minutes (Pari neb cups are one of the few manufactures who say their neb cups can be boiled, so use caution.) Another hot method is microwaving for five minutes (Again Pari brands are only one of the few neb cups that can be microwaved “depending on the particular Pari model”.) The third hot method is putting them in a dishwasher and washing at one hundred fifty-eight degrees for approximately thirty minutes (Again refer to manufacturer, as Pari neb cup are currently the only neb cups rated for hot methods of disinfecting.) Finally the last hot method is an electric steam sterilizer, like a baby bottle steamer. This is a very popular method for disinfecting neb cups in the PCD and CF communities. Hot methods of disinfecting are only recommended for neb cups (mainly the reusable Pari neb cups, but refer to your manufacturer’s recommendations.) It is important to note that hot methods used on equipment not intend to be sterilized in this manner can actually damage the neb parts; including all masks, mouthpieces, spacers, and neb tubing. The cold methods are as follows; soak in seventy percent isopropyl alcohol for five minutes, or three percent hydrogen peroxide for thirty minutes then rinse with clean sterile water. No matter which method that you use, it is important to remember to follow up both methods hot or cold by rinsing the neb parts in sterile water. You can buy sterile water from your pharmacist or make it yourself by boiling water for five minutes. Then be sure to allow the neb parts to air dry completely on clean towels/ paper towels prior to their next use. Remembering to not to put the face masks or mouthpieces face down on the drying surface to prevent the fibers of the paper-towels/ towels from collecting on the mouthpieces where they can then be breathed in during the next treatment. Neb tubing that connects the neb machine to the neb cup can be wiped after each use with a clean wet cloth or disinfecting wipe; never submerge neb tubing. The machine itself can be wiped as needed with disinfecting wipes between individual treatments. The air intake filter of your machine should NEVER be submerged in any liquid. Is it time to feed my nebulizer, and what does that even mean? Feeding your nebulizer is basically exchanging your reusable parts for new reusable parts. Reusable parts to neb machines are not meant to be permanent; they wear out, start collecting bacteria, and then the patient can become infected with the bacteria that is growing in their reusable neb parts. Exchanging out reusable neb parts is another essential step in maintaining your respiratory health. Reusable neb cups, masks, mouthpieces, spacers, and tubing should be replaced every three months, unless it is a Pari reusable neb cup system. Pari rates their reusable systems at six months instead of the industry standard of three months. Your reusable neb parts should also be exchanged for new reusable parts if they appear worn, damaged, or do not seem to be working properly or like they were when you first put them into use. Nebulizer machines should be cleaned with disinfecting wipes as needed or at least at the end of every day. If your neb machine has an air intake filter, the filter should never be cleaned or disinfected to extend the life of the filter; instead those air intake filters should be replaced every six months to maintain your machine’s level of performance. Air intake filters that appear wet or spongy should be replaced immediately even if the six month are not up yet. Neb tubing that appears to have moisture inside the tubing should also be immediately replaced, no matter how little the tubing has been used. Proper care and feeding of your nebulizer machine and it’s parts will extend the life of your machine, maximize treatment times, and protect your respiratory system from unwanted germs and bacteria. For more detailed information on your particular nebulizer system, including which reusable parts are appropriate for your exact nebulizer system, please speak to your particular care team. A quick note of caution, due to the powerful nature of some nebulizer machines, use of any incompatible reusable neb tubing or parts can actually cause those parts to melt. For instance, only Pari nebulizer parts should be used with a Pari nebulizer machine to prevent the neb tubing from melting onto the Pari neb machine itself. Be sure to visit us next week for another Topic Thursday! Pari Nebulizer cups should be replaced every ____ month(s), and all other nebulizer cups should be replaced every ____ month(s). Leave your guess in the comments section below. Tune in tomorrow to find out the answer and see how you did! Be sure and stop back by next week for another round of Tuesday Trivia! Pari Nebulizer cups should be replaced every 6 months, and all other nebulizer cups should be replaced every 3 months. The filter on your nebulizer machine (if it has one) should also be changed every 6 months, or when the filter gets wet or spongy. Be sure to join us this Thursday for our topic on the “Care and Feeding of Your Nebulizer”. I’ve noticed several PCD pages, images, and so on use the turtle image; is there any significant meaning towards PCD? The turtle represents our so called "turtle days", or also called "PCD crash days", a "PCD hangover", and so on. Every PCD patient has their own name for it, or we did until everyone connected up through Facebook. A PCD adult called their’s a “turtle day”, and it just struck a cord with most of the PCD community a few years ago. 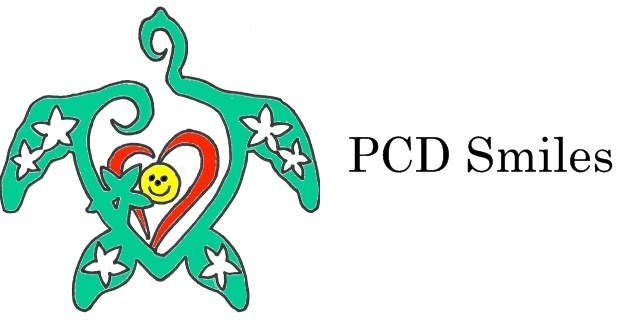 The logos for PCD Smiles and PCD Style were drawn by one of our team members a few years ago when the PCD craze over turtles began. Basically a turtle day is those days we just are so tired that we crash or just can't get going. Maybe the day or days leading up to it we have done a lot or had big packed days; then the next day we wake and can barely do anything but treatments, we may or may not have a fever, but we are definitely overly tired. So I hope the turtle day description makes sense. Do you have a question for Smile E.? And tune in next Sunday to read the latest Ask Smile E.
© 2018 Candr Ltd. All Rights Reserved.